I’ve been trying to write about this since I got the news on Monday, but it’s been too hard. 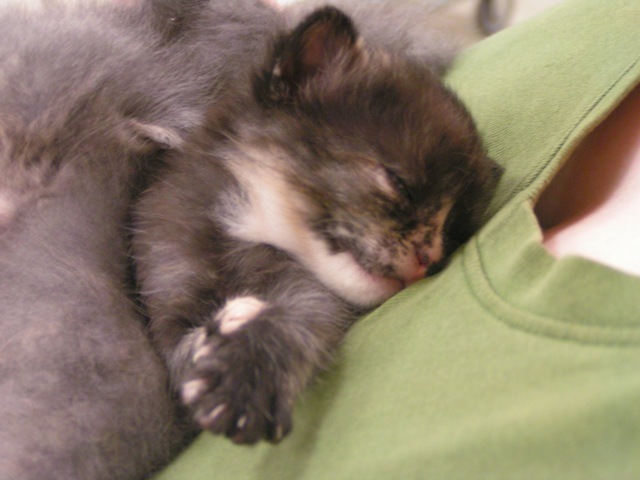 Wee, sweet Zeta was sickly last week; stopped nursing, and had to be bottle-fed by her tireless foster family. They thought she’d gotten past the worst of it, but she was just too tiny and sickly. She died over the weekend. Zeta was a beautiful, sweet-natured kittenface, who was content to snuggle against your chest and sleep, preferably with a sibling or two nestled around her. Pragmatically speaking, it’s a small miracle the other wallkitties are flourishing at all, after their hard start. Personally, though, they were ALL MY Wallkitties in a way; and I’m angry and heartbroken she had such a short life. I’m just glad it was filled with love from all over the place, even the Internet. So sorry! But maybe in her next life she won’t be a wall kitty at all, but will be born to happiness from the first moment. So lucky to have had the care and love you gave her. I’m sorry to hear about Zeta. *hugs* What a sad ending for such a sweet kitten. My thoughts are with you and the foster family. « My Birthday: Best Caturday Ever.